Hippie Couple | MWAH! S&P Shakers Figurines | One Price Low Flat Shipping! From Westland Giftware's Discontinued Salt and Pepper Shakers Collection, Hippie Couple Salt & Pepper Shaker Set. Made of ceramic with glossy finish. Measures 3.25" high. Hand wash only. Brand new in windowed gift box. 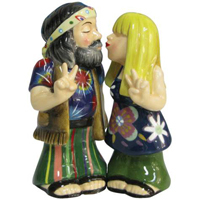 This salt and pepper shakers figurine set features a woman with long blonde hair in a flowered dress kissing a man with grey beard wearing a tie-dyed shirt, with both holding up the two finger peace sign. A strong small magnet hold these free spirits in a big happy...MWAH SMOOCH!